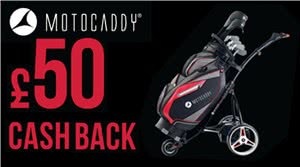 Motocaddy's biggest ever Sales Promotion starts this weekend. Between Friday 20th April and Saturday 30th June 2018, customers are able to trade-in any old electric trolley for £50 against a new Motocaddy Lithium Trolley. Treat yourself to a shiny new trolley while being lucky enough to receive £50 for your rusty old one! Your old trolley can be any brand, any age, any model and any condition - it doesn’t even need to be working. Not only that, but Motocaddy will also ensure that the old trolley is responsibly recycled by their specialist recycling partner. So as well as enjoying a £50 discount, you can relax in the knowledge that the old trolley is not going to landfill or damaging our environment. All you need to do is buy a new Motocaddy Lithium Trolley of your choice. Register your warranty on Motocaddy website and submit a Trade-in claim. Once Motocaddy has verified your claim, they will email you a free UPS shipping label. You need to put the old trolley in a box (without a battery), stick the label on the box and drop it off at your local UPS Access Point, of which there are more than 3,000 across the UK. Once Motocaddy has received your old trolley, they will make a payment of £50 directly into your bank account. Simple! Note: The promotion is only available in the UK Mainland and excludes Northern Ireland, Scottish Isles, Channel Islands and Isle of Man. It is also only available to customers that are UK residents and who hold a UK sterling bank account.